From 28-30th of April 2015, Girona Underwater Vision and Robotics team moved to Hotel Carlemany to organize IFAC NGCUV 2015 conference. The event took place in the nice city of Girona and counted on more than 90 attendees from 22 different countries. NGCUV goal is to show the latest investigations in Unmanned Underwater Vehicles as well as to promote the exchange of information and perspectives on the field’s current research. The Workshop brings together a diverse set of researchers who are jointly committed to foster the research and innovation in underwater robotics. The event series was initiated in 2003 and has been held in Newport (UK), Limerick (IR) and Porto (PT) since then. Along the conference, 6 invited speakers gave their talks on different subjects: 1) “The future of AUV technologies” by James G. Bellingham (Woods Hole Oceanographic Institution, USA); 2) “An innovative vehicle concept for ocean science: Ifremer’s hybrid ROV first sea trial experience” by Jan Opderbecke (Underwater Systems Unit, IFREMER, France); 3) “Towards Integrated Autonomous Underwater Operations” by Asgeir J. Sørensen and Martin Ludvigsen (Centre for Autonomous Marine Operations and Systems –AMOS-, Trondheim Norway); 4) “Opportunities for Underwater Robotics in H2020” by Michel Brochard, (European Commission, DG Connect A2 Robotics); 5) “The role of AUV’s in the Oil & Gas Industry” by Hugh Ferguson (Subsea7, Aberdeenshire – United Kingdom) and 6) “Reflections on a decade of Autonomous Underwater Vehicles for Marine Survey” by Stefan B. Williams (Australian Centre for Field Robotics Sydney, Australia). 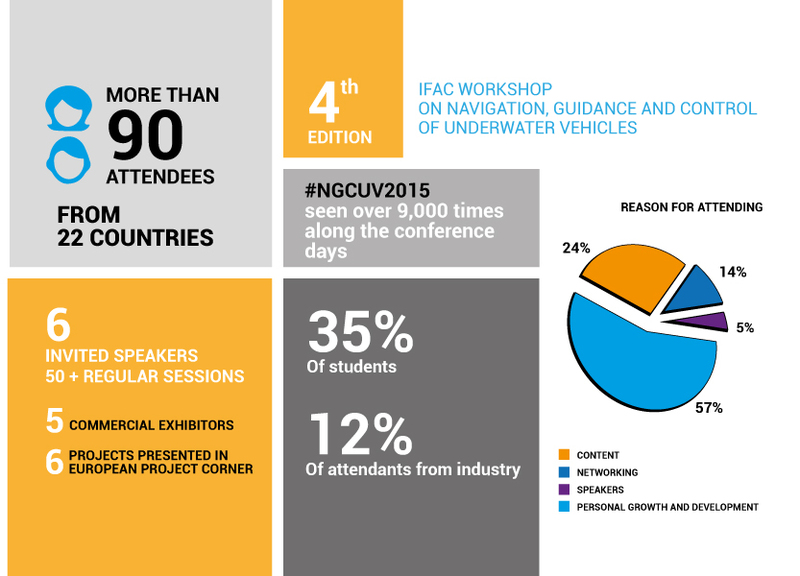 IFAC NGCUV 2015 brought together 50 contributions which were presented in parallel sessions on different topics: “Underwater Manipulation”; “Mapping and SLAM”, “Navigation, Control and Planning”, “Tracking and Localization”, “Operations”, “Vehicle Modeling & Design”, “EU Projects” and “Multiple Vehicle Systems”. A Commercial exhibition took place parallely in the conference hall. On the 27th, the team of the lab offered a tutorial on ROS for Underwater Robots. Our lab was also present in the Commercial Exhibition with the SPARUS II AUV and took part in the European Project Corner presenting its projects: PANDORA, MORPH and ROBOCADEMY.